The IRON MAIDEN family tree is quite florescent; members IRON MAIDEN stole from or disgorged to sum it up to a total of…numerous outfits existing in the 70s/80s in Britain. And if the average fan of these Metal legends can recall names such as WOFLSBANE, WHITE SPIRIT or SAMSON the list grows really strong and even serves as a separate encyclopedia for those thirsty for obscure Rock/Metal ‘satellite’ outfits rounding MAIDEN’s luxurious history. 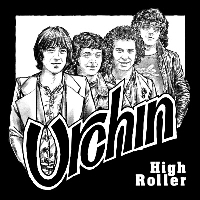 And, yes, URCHIN is one of these bands. With the ‘NWOBHM’ term logically crossing our minds, let’s just be quite exact and state URCHIN could be easily fitting into the pre-NWOBHM precursors. Located in London, the band was formed in 1974 by guitaristsDave Murray and Adrian Smith (both former members of a school band named EVIL WAYS - a rumour that Dennis Stratton was involved in this genesis has not been confirmed till now) and only two 7” singles were recorded as the original legacy of the band before each name stated above enjoyed fame shortly afterwards with the Maidens. “Black Leather Fantasy” (1977) and “She’s A Roller” (1978) are of course really scarce collectors items as we speak with prices raised high to some hundreds of dollars to be obtained by some serious collector or rabid IRON MAIDEN votary. With Punk music riding forth at those days, it’s no wonder URCHIN disappeared from the British mass quite soon (with names like IRON MAIDEN finding the perfect timing to have their own stars rising) and 1980 was the year they were officially calling it quits. Still, keeping in minds to record their good rehearsals during the second half of the 70s proved to be a great source for this compilation now offered on vinyl by premier label High Roller Records. None of the four numbers available in the two of the band’s singles are presented here, it should be noted. The style of URCHIN lays somewhere in between traditional British Hard Rock and Hammond-based late 60s Rock. The sound of the recordings is surprisingly clear and thorough leaving enough lots of space for the youthful guitars to crossfire while the Hammond- in some songs – gives an extra vintage touch. Pieces of psychedelic Rock are also found in slower moments (the wah-wah-effect was in motion) and the vocals of Smith steam passion and classical faith. Of course, it will not take more than one spin to release large excerpts of this style were transformed into the first couple of IRON MAIDEN albums. In strict metallic terms the “High Roller” collection may sound quite naïve and too old-fashioned. Still, living in the past is something more than just an obsession and bands like URCHIN with songs like these ones featured here were among the raw material for forming the neatest genre of Metal music called New Wave Of British Heavy Metal. I do not know if this compilation is to be released on CD too but- what the hell? – this is a good opportunity to grab a turntable and start collecting some vinyl stuff, yeah! P.S.1: In late 1985 Smith reunited with some of his URCHIN bandmates under the name “The Entire Population of Hackney”. The legendary Marquee Club in London hosted the event and a live bootleg recording was made. The IRON MAIDEN clan also appeared at the encore, along with FM members. P.S.2: If you remember the project Smith came up with in A.S.a.P. (Adrian Smith and Project) in 1989 (they recorded one album “Silver And Gold”), URCHIN members Andy Barnett (replacement of Dave Murray – also a member of premier British melodic rockers FM), Dave Colwell and Richard Young were proudly included in the lineup.